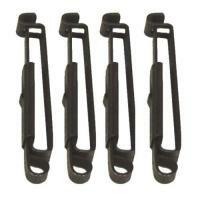 This is the authentic military ALICE clip which can be used to attach most BlackHawk pouches to your belt or vest. It works by sliding the back gate up or to the open position, attaching it to your gear and then sliding it on the belt or vest in your designated spot. You then close the gate and your gear is secure until you decide to remove or relocate its position. It is black anodized for the subdued look as well as corrosion resistant. Four (4) Alice Clips to a pack. Buy these if you want to attach your gear to your belt or pack.